In ancient Greek belief, it was thought that the spirit or presence of a Deity did or could inhabit their statue. So, I came up with a Hellenized rite that can be used to achieve such activation. But, before preforming on a given statue, I think there are some things to keep in mind. I think this should be done on a piece that is mostly or all stationary, not something that is constantly moved or carried around. The statue of my former Artemis sanctuary would be a good example. It was never moved, always remaining in the same place since the opening and dedication of the sanctuary. The only time it was ever moved was when my family left the property and the sanctuary had to be closed. And second, as I would logically imagine, once the consecration has been completed, and the spirit dwells, the statue becomes even holier than it was while empty. Therefore, it should be kept in a very secure place, perhaps even in a shrine area with doors, so as to keep out intrusions that may come into the room, as well as general dust, dirt and debris that come with every living place. If you cannot provide an enclosed space, just keep the statue clean and protected. 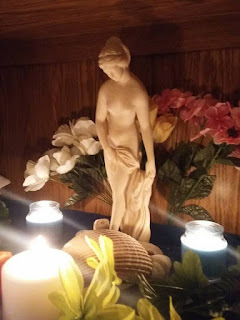 The rite I have constructed is based on what I have practiced and come to learn about Hellenic practices when statues and individualized worship comes into play. 1- The first step is actually for the worshiper, which is to clean themselves and put on clean clothing, that they may be presentable before the God. 2- With a bowl of clean, purified water, take a clean cloth and gently wash the statue. I might even say include sea salt in the water, but depending on the material of the statue, there may be a risk of damage if the salt particles remain on it for a long period of time. 3- Anoint the statue with an oil. Try your best to associate the kind of oil with the kind of God. For example, if the statue is of Aphrodite, you might use a rose-scented oil, or if for Artemis, an earthy kind of oil that could be tied to trees and other wild plants. You only need a small drop, the size of a pinhead. You should probably ideally touch the head of the statue with it. 4- Now's the time to invite the God in with an invocation. Ultimately, the contents are up to you, but below is a template, if you will, that you can use for inspiration. forever in my own home and life. 5- Present now a proper sacrifice to the God. Such as olives or olive oil to Athena, or fish or other water foods and meats to Poseidon. If you don't have such direct offerings, pour a libation or burn incense. 6- Robes of Honor. The statue should now be clothed in a ceremonial cloth, also considered an offering to the God, to express your welcome to them into your home, and also to adorn their statue in beauty. A unique robe can also be uniquely recognized by the God, and they will know your home or place of worship. These robes or cloths can take on various forms, but you should normally try to gear it toward the God in question. For example, a yellow sun colored one for Apollo, or red for Ares. Of course, these are basic colors. You have the option of adding things to the robes. The more unique you make it, the better. 7- Bring the rite to an end by giving your verbal gratitude to the God. It doesn't end there, though. Now you have only begun. Each day, give offering at this statue to the God. Even if it's something as simple as incense or a libation. Keep continuous relations going. The idea is to keep the God's recognition so they won't abandon the statue. In conclusion, this is how I would activate a statue. Feel free to use your own methods that you may find more suitable or historic.